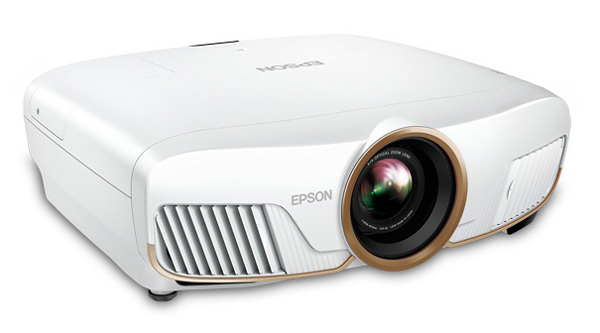 Epson today officially announced availability its Home Cinema 5050UB and Home Cinema 5050UBe 4K PRO-UHD projectors, the much anticipated updates for the Home Cinema 5040UB and 5040UBe first released in 2016. Priced at $2,999 and $3,299 respectively, the models are the same but for the inclusion of a 4K wireless HDMI transmitter with the 5050UBe. The Home Cinema 5040UB was well-received by enthusiasts and reviewers alike, winning accolades that included ProjectorCentral's top honor Editor's Choice Award. Its appeal came from a combination of relatively high brightness, good black-level and contrast performance largely attributable to Epson's UltraBlack LCD imaging panels, convincingly sharp resolution for 4K content using 1080p imagers thanks to sophisticated pixel-shifting technology, and a variety of unexpected premium features including high-end optics, lens memories, and a dynamic iris. All of this has been carried over to the new HC 5050 family, along with some recent advances debuted late last year with the step-down Epson Home Cinema 4010, another Projector Central Editor's Choice winner. Among these is an updated pixel-shifting scheme said to deliver improved clarity and Epson's latest Digital Cinema color mode that achieves the full DCI-P3 color gamut for today's HDR (high dynamic range) UHD content. Epson has also upped its game on its HDR tone-mapping and added support for HLG along with HDR10 content. Another much-welcomed addition to the new model is an 18 Gbps HDMI 2.0 port, something sorely missed by gamers in HC 5040 because of its limitations on frame rate with HDR content. 2,600 lumen brightness rating, up from 2,500 lumens in the HC 5040. Rated dynamic contrast ratio remains the same as the HC5040 at 1,000,000:1. 3LCD design that delivers equal white and color brightness, and is immune to rainbow artifacts that can occur with projectors that utilize a single imaging chip and color wheel. Epson's UltraBlack LCD imagers, which use a proprietry filter designed to suppress light leakage and improve black level. Epson's late-generation 4K PRO-UHD pixel-shifting technology to create a 4K-like image using 1080p imaging chips. First introduced in the HC 4010 and its sister model Pro Cinema 4050, this latest iteration benefits from more rapid pixel shifting to deliver sharper edges to the pixels. HDR support for both HDR10 and HLG high dynamic range content, and a new 16-step slider control to fine-tune the gamma curve for specific content and adjust the balance between brighter highlights and the retention of highlight and shadow detail. Epson has retained the Digital Cinema color mode designed to reproduce the full DCI-P3 color gamut used to master today's UHD-HDR content. As noted, HDMI 2.0 support now allows gamers to play 4K/60p games with HDR. The HC 5050 fully supports 4K HDR at 60 Hz with up to 4:4:4 (uncompressed) chroma subsampling at 8 bits, or 4:2:2 with 10- or 12-bit processing. 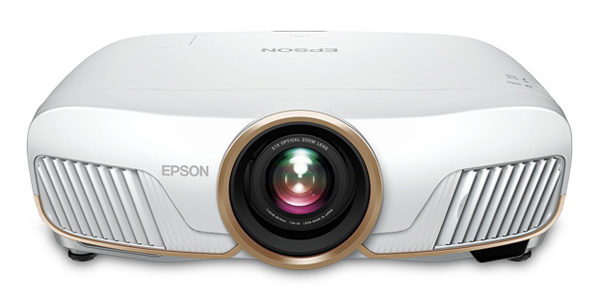 Epson has carried over the high quality 16-element/15-glass element powered lens used in the HC 5040 and recent HC 4010, with the same wide-range setup capabilities: 2.1x zoom; +/- 96% vertical, +/- 47% horizontal lens shift. Improvements have been made in the 5050 to the fine adjustment of the lens shift to better accommodate the narrow bezels on "zero-edge" screens. The ability to store multiple lens memories for constant-image-height (CIH) setups on 2.35:1 screens remains. As with the predecessor 5040UBe, the HC 5050UBe model is shipped with a WirelessHD transmitter that allows connection of up to four HDMI devices and transmits up to 4K/30 Hz content with HDR. 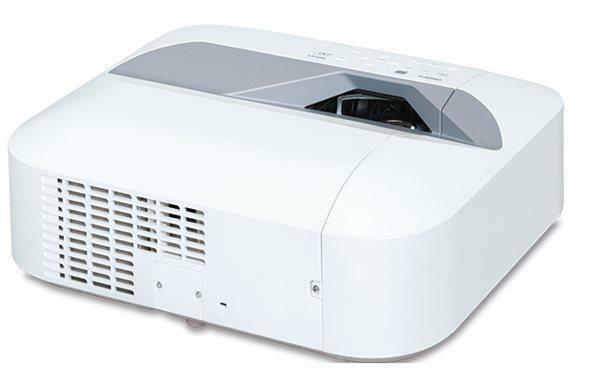 The projectors are supported by a limited 2-year warranty, 90-day limited lamp warranty, Epson's PrivateLine priority customer support, and free two-business-day replacement should that ever be required with Epson Extra Care Home Service. Both the Home Cinema 5050UB and Home Cinema 5050UBe are available now through Epson's online store and select online retailers. When can we expect a full review and comparison to the 5040? I'd also like to see some comparisons with the 5030 (for those of us stuck in the stone age with a 1080p PJ and ready to make the jump to 4K). Our review of the 5050 is in progress and will be out shortly. We'll move on to comparisons with the 5040 and 4010. A comparison with the 5030 is unlikely at this point, but the 5050/5040 face-off could be important for a short time while the latter is closed out. I don't doubt that the 5050 is a solid advance, but the 5040, which is currently going for about $2,000, is a pretty sweet deal, and we established in our comparison of the newer 4010 and 5040 that the superior blacks on the 5040 made it the better of these otherwise very similar projectors. But the 5040, according to reviews on Amazon, was having power supply issues on many units. I was ready to buy one until I read those reviews, especially since Epson was apparently doing nothing about the issue. Jim, this has obviously come up a number of times in discussion of the 5040 and although this was indeed addressed in later production, Epson has said there's always the chance that any particular unit just purchased might have been sitting in the retail channel and has the potential to have these issues crop up. As I've written elsewhere in comments about this. Epson has been pretty good about taking responsibility and replacing units as needed, at least those still under warranty. I wouldn't necessarily dismiss purchase of a 5040 right now while it's being closed out at around the same price of a new 4010. The blacks are noticeably better. It sounds like this model corresponds to the EH-TW9400, which for some reason has been announced already in Sept 2018 and available in stores in early 2019. I was just wonder just in the difference in contrast specs, which in the above mentioned model is declared as 1'200'000. Mat, I was aware that the EH-TW9400, the similar unit for the European market, had been released much earlier; it made many of our readers anxious and confused about why it was taking so long for the U.S. version to come out. One thing I can tell you is that Epson was taking extra time to tweak the 5050; it was still a work in progress when I saw it under NDA at CES in January. So I'm not sure what was done in the interim and what differences there might ultimately be between these units; I'm guessing the TW9400 will likely enjoy a firmware update to bring it up to date with whatever tuning was done on the 5050. As for the contrast ratio spec, when I saw the projector in January I was told at the time that the 5050 was also to be rated at 1.2 million:1 dynamic, but at release all the materials are saying 1 million:1. I gather that modest improvement didn't pan out consistently after the final tuning and they went with the more conservative spec. It's not a significant difference on the screen, if even noticeable. Been waiting for this!!! Really looking forward to your review. I am currently waiting for my 5050ub to arrive. However, I ran the calculator for the 5040ub for my specific setup. Running the exact same numbers using the new 5050ub, which has 100 lumens more, gives a result of only 23 foot/lamberts. 20 f/l difference. Is the data for the new 5050ub incorrect or is the 5040ub's data incorrect for the past three years? Gellert, I wouldn't be concerned or put too much credence in our rough lumen estimates. They are most often based on a percentage we apply to the full rated lumens light output in an effort to guess what the output would be for the ideal optimized picture, which presupposes that (1) the output actually lives up the the manufacturer's specs and (2) that we have guessed well about how much to cut back the maximum lumen spec from the max output upon which to base the calculator figures for different throw distances and screen sizes. Sometimes, however, the calculator lumen numbers are based on the actual measurement we took during our review for optimized viewing. In the case of the 5040, we likely updated the calculator to reflect the hands-on measurement, and it's probably reflective of what you'll get with the 5050. An upcoming update to the calculator will make clearer for you and other readers how we arrive at these numbers for any given projector. I will be interested in your review regarding 3D. Some people noted that the 5040 had ghosting problems. Hopefully Epson has fixed these problems with the 5050 release. Why does the new Epson 5050UB only come with one year warranty? Just making sure everyone knows that the 5040/6040 3D ghosting issues were due to having the auto-iris enabled during 3D playback. Turning the auto-iris off eliminates the ghosting. Presumably, the 5050 will be the same. Thanks for that info, Scott. I never experienced any serious issue with ghosting on the 5040 but only tested it briefly with a few titles. Can you please compare the Epson 5050ub with the BenQ HT5550? Thanks! That would seem to be a logical and helpful comparison. We expect to have both models in house soon and will keep this suggestion in mind. Although the incremental changes are nice, I would be much more intrigued if they were to increase the native LCD resolution to 2560x1080, 3840x1440, or 3840x1600. 3840x2160 or 4096x2160 would be nice but I think I would prefer one of the "scoped" aspect ratios so no more fiddling, lens memory, etc. I would prefer to have black bars on the side if the content is just 16:9. Twice I've set out to buy a Epson projector and twice I've ended up disappointed and with something else. Last one was whatever competed with the Sony 40es when that came out. 3rd times the charm? I was hoping they'd go native 4k. James, we have no idea right now but expect to do a comparison. On paper, the two key ingredients that may make a difference are the latest HDR tone-mapping controls and tuning, and the two HDMI 2.0 ports on the 5050 that allow the 5050 to display HDR content at 60 frames per second, which is likely only important to you if you play videogames. Otherwise, only marginal difference in brightness that is likely too small to make a visible difference at optimized settings and essentially the same black levels from the Epson UltraBlack panels. This is an update of an already pretty good projector, but not a revolution.